In 1982, the average Briton didn't know the Falkland Islands existed, let alone their status as a disputed British territory just off the coast of Argentina. That changed when the Argentinians invaded the islands and overwhelmed the small defending force. Both nations claimed the islands were theirs, but now Argentina thought the British would give them up without a fight. Britain sent a task force into the South Atlantic to re-take the islands, and the short, intense war that followed was--in the words of Major-General Sir John Jeremy Moore - damn close-run thing. This short history sums up the events leading up to the war and its major military actions including details of an Argentinian plan to sink a Royal Navy ship in Gibraltar harbour (foiled at the last minute by Spanish police) and an audacious British plan to land SAS soldiers in Argentina to destroy Exocet-carrying aircraft while they were still on the ground. This is a very quick overview of the Falklands War, coming in at less than 90 minutes. As such it keeps each section to the bare minimum, giving just the facts and nothing more. It provides a clear and board coverage of the events leading up to the war, the actions taken during the war and the fallout afterwards. As I knew very little about the war beforehand this book proved a great introduction. If you want something in depth, there are a variety of much longer audiobooks available. But this is a great overview and introduction for someone who doesn’t need to know the minutia of each event. As narrator Mather is good. He is clear and easy to understand and his deep voice brings gravitas to the subject matter. Easy and enjoyable to listen to. If a history buff it is a Great book. I think of all the things we didn't have in 1983 like the internet. Think how that changes a nations view of war. 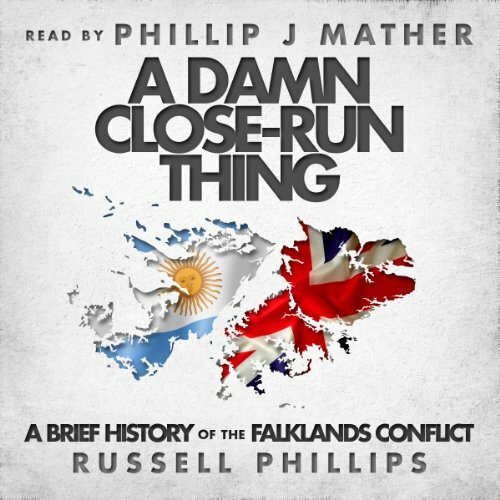 A brief history of the Falklands conflict By Russell Phillips and read by Phillip J Mather. This book is less than two hours in audio form and having a map and a notebook is suggested by this reviewer before listening to gain the most enjoyment from this very detailed book. I was in High School myself during this conflict and remember well the United States Media take on this conflict. The Falklands Conflict and the United States own Grenada Incident were the last two major conflicts before the Intetnet. Although this story tells of the BBC reporting troop readiness and thus alerting Argentina to an upcoming assault it is nothing like CNN on the beaches in the Middle East during the first gulf war. This audiobook takes you through each major and minor battle from both the United Kingdoms and Argentinas archives. The book describes soldiers acts of valor, of faulty equipment, ships being sunk for the first time since World War II, and the interaction of both countries allies as they work to procure and contain modern missile disemenation. The fact that 13 kilometers are still mined in the Falklands was amazing but more so the environmental impact of the minefields creating a safe Penguin habitat safe from humans. Again this book is full of facts, and as usual the winner writes the history. Argentina continues to this day to peacefully have diologue with the UK but as more and more Oil Platforms go up in the south Atlantic the UK is less and less likely to conseed any of the Falkland Islands back to Argentina.